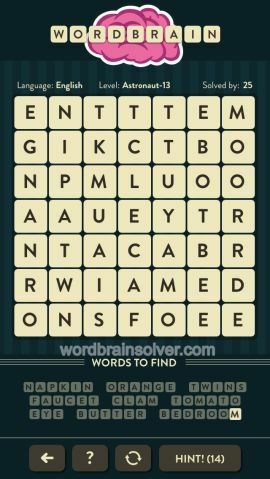 Wordbrain Astronaut Level 13 Answers and Solutions. board on mine is not same as above. however I did get some answers. there is no faucet. word is worker/\/\..
and I cannot get butter or tomato. any help would be apprerciated. CAN ANYONE HELP ME WITH ASTRONAUT 13. MY BOARD IS NOT THE SAME. DO NOT HAVE THE WORD FAUCET. It is worker instead offsucet and there are many placeds you can put orange keep trying it does comeoutcorrect in the end.